When the human brain experiences trauma, it changes. As the brain develops over time, the intensity of childhood trauma can lead to a range of mental health and behavioral problems, including addiction, domestic violence and medical issues, according to the Adverse Childhood Experiences study conducted by Kaiser Permanente and the Centers for Disease Control and Prevention in the 1990s. Since that study was published, experts have investigated how the brain changes in response to trauma. When the brain is exposed to traumatic experiences, the prefrontal cortex, the part of the brain responsible for decision-making, may be smaller than normal. The amygdala, the part of the brain responsible for decoding emotion, may be larger than normal. Rational decision-making processes are stunted while emotions are unchecked, often leading to what might seem like unreasonable distrust. According to Matt Bennett, an author and expert in trauma-informed care, street outreach has proven to be one of the most effective ways to exercise trauma-informed care with the homeless population. “Once we understand the neurobiology, it helps us understand why some of our historical solutions haven’t worked,” he said. When Catherine Crosland, a physician with Unity Health Care, approaches a homeless individual on the street, she typically starts out by asking how they are and whether they would be amenable to a blood pressure test. If they comply, Crosland proceeds with the test while asking the patient questions about their health care. “We approach people to build relationships, check on folks who haven’t seen doctors in years… we try to meet them where they are,” said Crosland. “Trust me man, you’re a great deal, you’re the real deal,” said a patient as Crosland examined his foot injury. While street outreach specialists may develop some semblance of trust with clients, it is often difficult to connect homeless individuals with resources they need. Before street outreach specialists with Pathways to Housing can begin their work, they must complete a one-month training to learn how to meet clients where they are and move at the client’s pace. But street outreach is not a method limited to a few D.C. nonprofits. 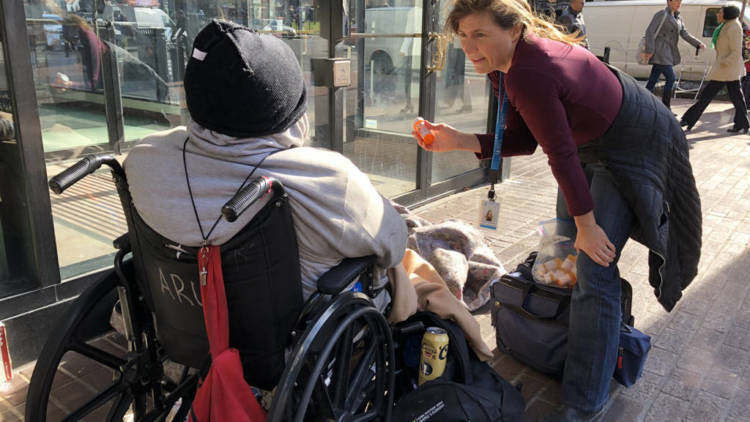 The Substance Abuse and Mental Health Services Administration (SAMHSA) within the U.S. Department of Health and Human Services recommends and implements street outreach programs to connect with homeless clientele. SAMHSA launched the National Child Traumatic Stress Network in 2001 and the National Center for Trauma-Informed Care in 2005 to assist with individual traumatic events.